When starting with crude degummed oils that have not been alkali refined, then step one is usually performed by the crusher and steps 2, 3 and 4 by our Biodiesel Technology. 1. Water washing oils removes hydratable phospholipids (HPL). This is usually performed when the oil is pressed and not at a biodiesel plant. When they have an H+ next to the –O on the phosphate group they are hydratable. When they have a Ca++ or Mg++ they are non hydratable. Ca++ and Mg++ are divalent so they would attach to two phosopholipids. H+ is monovalent so it would attach to one phospholipid. 2. 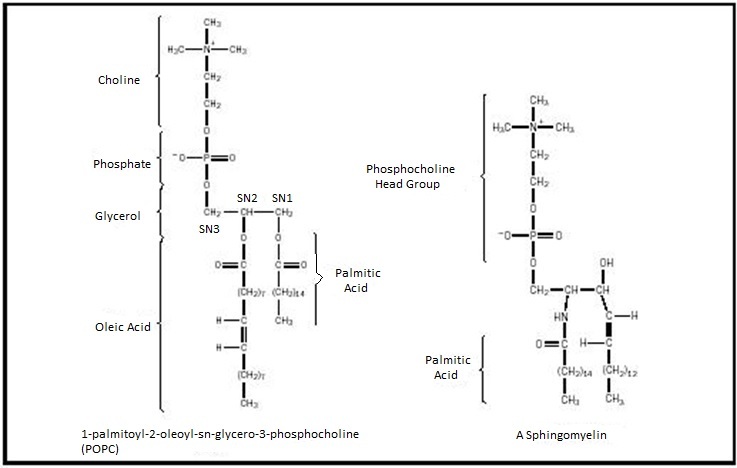 Degumming – Acidification converts non hydratable phosopholipids (NPL) to hydratable phosopholipids (HPL) by acidulation. The Ca++ and Mg++ are converted to H+ with phosphoric acid or citric acid and the newly created HPLs are washed out of the oil. The phosphoric acid ties up the calcium as calcium phosphate or calcium citrate and magnesium as magnesium phosphate or magnesium citrate. It also ties up and removes all heavy metals which can be catalyst poisons in solid catalyst esterification. These are either metal citrates or metal phosphates. 3. Esterification converts Free Fatty Acids (FFAs) and methanol to biodiesel (fatty acid methyl esters) and water. The catalyst was traditionally sulfuric acid but this requires all Hastelloy C equipment. In addition the water/ acid may form an emulsion with the oil that is difficult to separate. Use of a solid catalyst with –SO3H groups eliminates some of these problems. You can think of it as solid sulfuric acid. The Triglycerides are spectator species and just go for a ride through the one or two fixed bed reactors in series. We phase separate out water/methanol after each bed. There is usually a step to flash off all remaining water before going to transesterification. There is renewed interest in using methane sulfonic acid as a catalyst for esterification. This does add a neutralization step to esterification to neutralize excess catalyst. The solid bed catalyst does not require this neutralization step. 4. Transesterification converts triglycerides and methanol to biodiesel or fatty acid methyl esters and glycerin. We use 30% sodium methylate dissolved in methanol as catalyst. We do not use NaOH or KOH because they react with methanol to form water and sodium methylate or potassium methylate. The water reacts with triglycerides to form glycerin and FFAs that in turn react with the Na+ to form soap which is an impurity that has to be removed. On first generation plants with only transesterification and no flash drum upfront; water that is in constant contact with triglycerides generates sodium soaps as mentioned in the chemistry in the previous paragraph above. Typically 6 moles of methanol are fed to the reactor with 1 mole of triglyceride. This is also known as double stoichiometric. This insures the reversible transesterification reaction goes to right and you achieve completion. 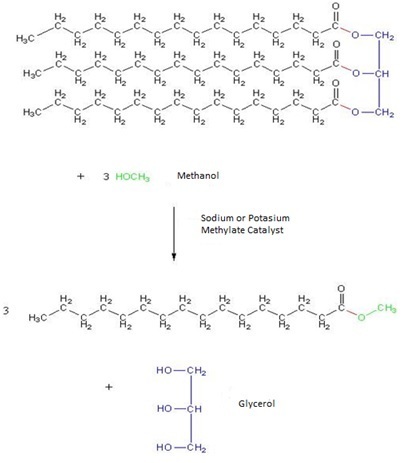 The transesterification reaction proceeds sequentially as each fatty acid is detached from the glycerin backbone, a triglyceride becomes a diglyceride then a monglyceride and finally glycerin. Industrially 30% sodium methylate in methanol is the catalyst of choice. We also get some soap from the catalyst sodium methylate reacting with the fatty Acids groups as they break off from the glycerin backbone. If there are no FFAs in the feedstock go directly to Transesterification Process. If there are FFAs go to degumming then esterification and transesterification. FFA content varies with Feedstock. Refined, Bleached and Deodorized (RBD) oil has no FFAs such as RBD soy or RBD canola. Different oils have different FFAs hanging off the glycerin back bone. The more saturated fatty acids affect the higher the cloud point. This point is that precipitation occurs typically from methyl stearate and methyl palmitate. Percentages may not add to 100% due to rounding and other constituents not listed. Where percentages vary, average values are used. Fatty acid compositions depend on the sources of the oils. Canola oil is made from selectively bred rapeseed plants that contain less than 2% erucic acid. Some crops have produced canola oil with 76% oleic acid. The table lists the linoleic type of safflower oil; oleic types of safflower oil have approximately 78% monounsaturated, 15% polyunsaturated, and 7% saturated fatty acids. Not shown in this table: Coconut oil, also called copra oil, has 8% caprylic acid (C8:0). Cod liver oil has 7% palmitoleic acid (C16:1), 17% C20 unsaturated fatty acids (10% EPA), and 11% C22 unsaturated fatty acids (6% DHA). Peanut oil has approximately 5% of C22:0 and C24:0 fatty acids. Palm olein is the liquid fraction obtained by the fractionation of palm oil after crystallization at controlled temperatures. Cow butterfat has 4% butyric (C4:0) and 2% caproic (C6:0) acids. Goat butterfat has 4% butyric (C4:0), 3% caproic (C6:0), and 3% caprylic (C8:0) acids. Beef tallow, cow butterfat, human butterfat, and lard all have about 3% palmitoleic acid (C16:1). Human depot fat, usually found in the abdomen of men and around the thighs and hips of women, has a composition similar to lard. 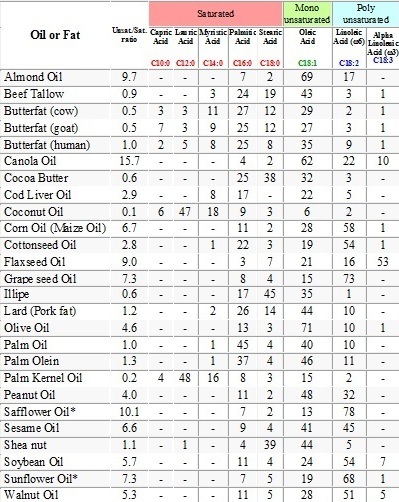 What are the triglyceride profiles of these fats and oils? The percentages in the table above reflect the overall proportions of the fatty acid radicals in the triglycerides. If we had 33 representative triglyceride molecules containing 99 fatty acid radicals, the number of each fatty acid radical in these 33 molecules would be proportional to its percentage in the table. For example, 33 representative molecules of lard triglycerides would contain, on average, 26 radicals of palmitic acid (C16:0), 14 radicals of stearic acid (C18:0), 44 radicals of oleic acid (C18:1), and 10 radicals of linoleic acid (C18:2). These fatty acid radicals would be distributed randomly among the 33 triglyceride molecules. The typical lard triglyceride molecule would have one or two radicals of oleic acid and one radical of palmitic acid. Frequently, there would be triglycerides with one radical each of oleic, palmitic, and stearic acids. Only rarely would one encounter triglycerides with only palmitic and stearic acid radicals. Each square represents the fatty acid components of a representative triglyceride molecule. This profile was constructed using a random distribution of the appropriate percentages of the fatty acids in 33 representative triglyceride molecules. Red is used for saturated, green for monounsaturated, and blue for polyunsaturated fatty acids. Although the composition of the individual triglyceride molecules may vary, the relative proportion of fatty acids remains constant. The profiles for canola oil or olive oil would be mostly green and blue with very little red, whereas the profile for coconut oil would be mostly red. 5. Catalysts – Sodium Methylate 30% in methanol is the most common catalyst. Others produced on site from hydroxides are undesirable as they produce water. Before transesterification there is usually a flash evaporator to remove water. If the water is not removed triglycerides can hydrolyse with water in the transesterification reactor to produce free fatty acids and glycerin. The newly created FFAs and any unreacted FFAs from the esterification process up stream in turn react with the sodium methylate to produce soap and methanol. Soap ends up in the glycerin layer. If high FFA oil goes into the transesterification process directly, all FFAs get converted to soap and reduce the available catalyst. Water Wash – Washing the biodiesel after phase separation removes methanol, soaps, unreacted mono and diglycerides. The methanol must be stripped from the water for recycle and the waste water goes to a POTW or discharged to a public waterway through an NPDES permit. Some plants evaporate the wash water for recycle and reuse. Dry Wash – The drywash system uses an ion exchange bead where micro fine droplets of glycerin adhere to the bead. No ion exchange is actually being performed. The glycerin pulls in the unreacted monoglycerides, unreacted diglycerides and sodium soaps. You now have purified biodiesel. Typically two beds of the ion exchange beads are installed in parallel and they operate in a lead lag configuration. The beads are back washed with methanol to renew them for continued use. Enzymatic Processes perform both esterification and transesterication with the same dual enzyme catalyst. COSTELLO implements one-of-a-kind process engineering with exceptional knowledge and experience, process safety support and superior customer service. Contact us today for your biodiesel project needs!